GBRow 2013 race leaders, the Islanders, took advantage of flat seas to power their up the Irish Sea during the night to claw back lost time on the word record pace. At one stage last night they recorded five knots, as wind and tide helped them to make up lost time. Their boat, the Black Oyster, is currently just north of Wicklow, ten miles out from the Irish coast and 64 miles west of Aberdovey on the Welsh coast. Just over 90 miles to the south, second place Savoir Faire are safely round Land’s End and making over three knots heading north towards the Bristol Channel. They are now 30 miles from Land’s End, the most south westerly point in this 2,000-mile non-stop race around the British mainland. 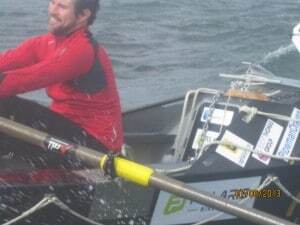 Later today, Jason McKinlay and Josh Tarr in Savoir Faire will reach the point where Oarsome Adventures were forced to quit after their steering gear smashed in rough seas on Friday. Three days later, the conditions are completely different, with much calmer seas and a gentle tail wind – perfect for ocean rowing.